Precocious as a child, Camille Saint-Saëns was once known as the French Mendelssohn. The remarkably assured First Symphony, completed at the age of 17, was praised by Berlioz and Gounod at its first performance. The elegantly crafted Second Symphony defies convention, not least by basing the first movement on a fugue, while the symphonic poem Phaéton skilfully brings this Greek mythological drama to life with stampeding horses, thunderbolts and a moving apotheosis. 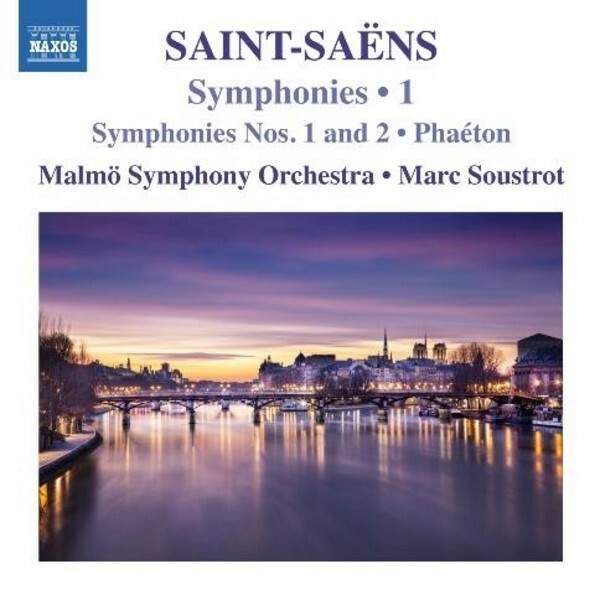 This is Volume 1 of 3 devoted to the five Saint-Saëns Symphonies. The Malmö Symphony Orchestra has a highly distinguished track record in recordings, for instance in its Naxos set of Edvard Grieg’s orchestral music, of which ClassicsToday.com stated, “as with previous releases in this series, the performances are outstanding” (a 10/10 review of volume 6, 8.572403). Complete recordings of Saint-Saëns’s symphonies are rare, the only readily available cycle being the venerable 1970s cycle conducted by Jean Martinon. The prospect of this new three volume set, richly embellished with other orchestral works and conducted by acknowledged French music expert Marc Soustrot, will provide a welcome and popular alternative.